A contemporary painting sets the tone for a family-room revamp. The old adage that life imitates art could not be truer than in this transitional, casual family room. Found by the husband, the Alex Katz painting hanging above the mantel struck his eye because “it’s an amalgamation of our four daughters who were all blonde tow heads as children.” The meaningfulness of the painting coupled with its color palette launched a total redesign of the space with designers Kim Taylor West and Leah Jarrell of K. Taylor Design Group. In addition to being dated, the family room’s function also needed an upgrade. “The family wanted to update the room to have more seating so all six people could sit in the room and have conversation,” Kim explains. Having worked with the family for over half a decade, Kim was well versed in their style, which she says is transitional but leaning to contemporary. But this wasn’t always the case. The wife favors a more traditional aesthetic, while the husband is more modern and contemporary. Often playing the “quasi marriage counselor” as the couple puts it, Kim has helped combine their two styles into a cohesive look the two can both be comfortable with. To achieve the light and airy feel the homeowners desired, Kim selected a French gray hue for the walls. 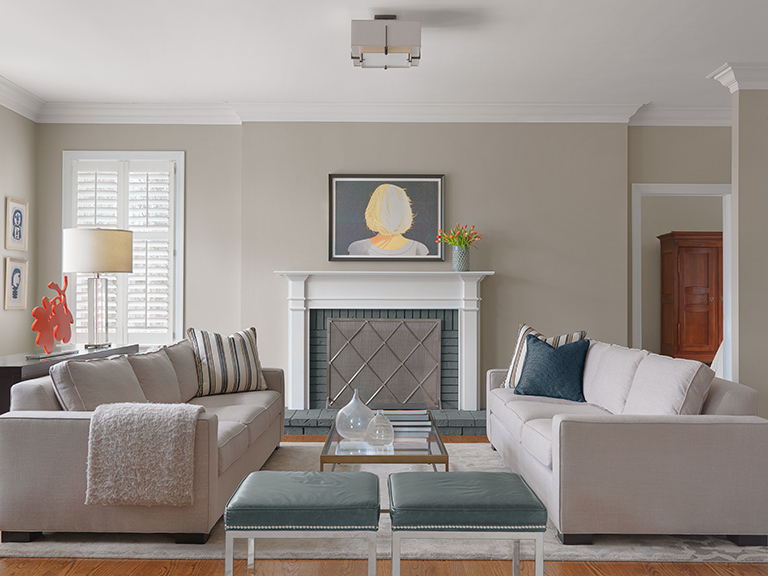 The fireplace surround, which was previously an exposed brick, was subtly modernized by painting the brick a darker shade of gray, which makes the white mantel pop. Dual blue/gray leather ottomans continue the warm color scheme while providing additional seating in the room. “The ottomans paired with the two sofas creates a nice u-shape for conversation,” Kim explains. For a pop of color in the serene space, the homeowner purchased the red lantern flower sculpture by Donald Sultan from Lococo Fine Arts. “My mom taught me that every room needs a splash of red to be properly decorated,” the homeowner says. The metal-and-glass coffee table was chosen for its open, airy affect. The bronze frame is one of several metal finishes in the family room, which Kim likes to mix for a more eclectic-type look. Custom toss pillows with navy and gold accents add a touch of elegance without being too formal for a family room.